Department Of Homeland Security Promises Changes To Protect Migrant Children Secretary Kirstjen Nielsen promises new "extraordinary protective measures" in the wake of the death of a second migrant child this month. They will require assistance from multiple federal agencies. Homeland Security Secretary Kirstjen Nielsen announced a host of "extraordinary protective measures" designed to improve conditions for children and adults held in U.S. Customs and Border Protection custody. In the wake of the death of a second migrant child in U.S. custody within the past two weeks, Homeland Security Secretary Kirstjen Nielsen announced on Wednesday the government is calling on several federal agencies to help U.S. Customs and Border Protection implement a host of new directives intended to improve how it cares for children and adults held in federal facilities. 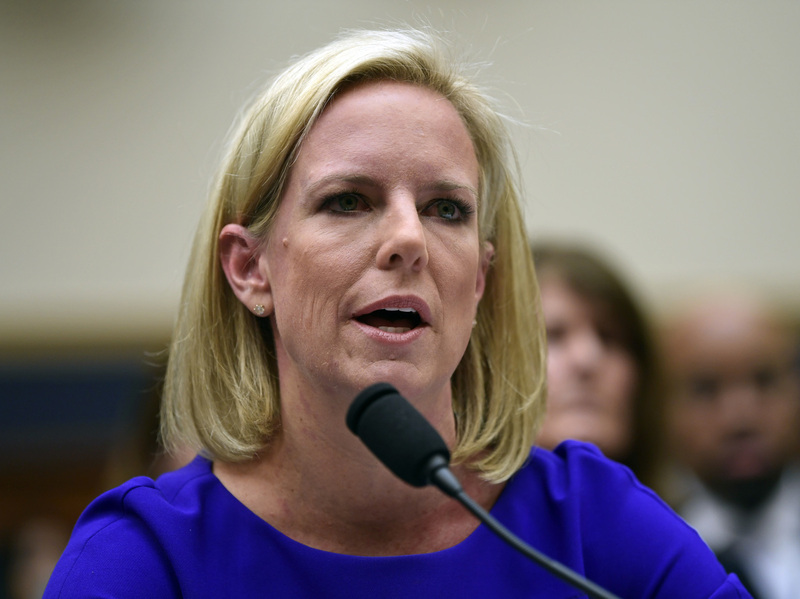 "In response to the unprecedented surge of children into our custody, I have directed a series of extraordinary protective measures," Nielsen said in a statement. She explained the changes had been enacted as a result of the "heartbreaking" death of Guatemalan Felipe Gomez Alonso, 8, who died after being diagnosed with a cold and a high fever in New Mexico on Monday night. Jackelin Caal Maquin, a 7-year-old girl also from Guatemala, died of dehydration and septic shock on Dec. 8, two days after she was taken into custody with her father. "It is now clear that migrants, particularly children, are increasingly facing medical challenges and harboring illness caused by their long and dangerous journey," Nielsen said. The recent fatalities are the first such child deaths in more than a decade, according to Nielsen, who cited the remote locations of their crossings and lack of resources as the primary obstacles preventing first responders from dispatching assistance. As of Tuesday, Border Patrol agents had started conducting secondary medical checks on all children in CBP custody, including unaccompanied minors and those part of family units traveling with other family members or legal guardians. "Moving forward, all children will receive more thorough hands on assessment at the earliest possible time post apprehension – whether or not the accompanying adult has asked for one," Nielsen said. The Homeland Security secretary said she had tapped the Department of Defense to boost medical staffs along the border as well as the U.S. Coast Guard Medical Corps to assess CBP's medical programs and make recommendations for improvements. Additionally, Nielsen said, "I have personally engaged with the Centers for Disease Control to request that their experts investigate the uptick in sick children crossing our borders and identify additional steps hospitals along the border should be undertaking to prepare for and to treat these children." An earlier statement by CBP Commissioner Kevin McAleenan noted the agency is considering requesting further aid from the Federal Emergency Management Agency and Health and Human Services "to assist U.S. Border Patrol supplemental medical capabilities." With regard to the partnership with the CDC, McAleenan said the two agencies would coordinate "on the numbers of children in custody as well" – a suggestion that drew sharp criticism from Rep. Lou Correa, a member of the Congressional Hispanic Caucus from California and chairman-elect of the House Homeland Security Oversight Subcommittee. "In this age of high-tech interconnectivity why is it that we don't have an accurate headcount?" he asked. "It raises a whole number of red flags." Correa supported the announced move by CBP to begin a full review of its policies regarding "the care and custody of children under 10 at intake and beyond 24 hours in custody," saying a broader mind shift in the way migrants are perceived by Border Patrol agents and politicians is long overdue. "CBP and Border Patrol have not figured out that this a refugee and humanitarian crisis. They're still stuck in a mentality of zero tolerance and deterrence, when in reality what you have are families fleeing violence who need doctors and social services" when they arrive in the U.S. seeking asylum, Correa said. The congressman said promises of more medical personnel do not sufficiently address the systematic and management problems within CBP that allowed for the deaths of Jackelin and Felipe. In the boy's case, "he was transported to a local medical facility, then he was released and then he died" Correa said. "That tells me we still have a lot of gaps in the system that we need to address." Andrew Meehan, CBP assistant commissioner for public affairs told NPR there has been a "dramatic increase in the numbers of families and kids that are approaching the border." According to CBP, 48,287 family units were apprehended during October and November, which is in contrast with 11,852 family units that were apprehended during the same period in the previous fiscal year. The number of unaccompanied minors is also on the rise; 10,265 children traveled alone in October and November of this fiscal year, whereas, 7,127 were taken into custody over the same two months the previous year. Meehan said the shift in demographics among arriving migrants has placed tremendous strain on existing intake systems and detention facilities built 20 to 30 years ago. "They are meant to handle single adults usually traveling for seasonal work" from Mexico, he said. Secretary Nielsen placed the blame for the influx of young children on parents, suggesting that America has "an immigration system that rewards parents for sending their children across the border alone, a system that prevents parents who bring their children on a dangerous and illegal journey from facing consequences for their actions, an asylum process that is not able to quickly help those who qualify for asylum." Under current law, non-Mexican unaccompanied children cannot be released or removed from the U.S. – they are turned over to Health and Human Services for placement, while family units are typically released into the interior while they await asylum proceedings. Rep. Joaquin Castro, D-Texas, who is the incoming chair of the Congressional Hispanic Caucus, told NPR's All Things Considered he hopes CBP moves quickly on its latest plan to relieve overcrowding issues in Border Patrol stations and checkpoints in El Paso. Officials said they are "reviewing all options" to reduce the number of people in custody by partnering with local nongovernmental organizations to provide temporary housing. "I hope that [CBP] will ask Congress for the medical resources and supplies and training and equipment and personnel that they need to properly treat the migrants who are arriving at the U.S. Mexico border," Castro said. "It should be noted that the lack of training and equipment and staff also presents a danger to the personnel from CBP who work there," he added. He added that it is "remarkable" that Congress has not received an official count of the number of children who have died in CBP custody over the last year and called on the agency to release the information immediately. "Because the president has taken such a dehumanizing and criminalizing tone when it comes to asylum seekers and migrants, I think it's important to get an answer to that question," he said. "And until we get an official count, I think with this administration anything's possible." NPR's Joel Rose contributed to this report.